IUE members in Fallon. From left to right. Mike Kubiak, Bill Archer, Mike Tolzmann, Jeff Martens, John Hendrick, Tim Walden, Don Belgarde, Jeff Meadows. Photo by Howard Stieger 2014. 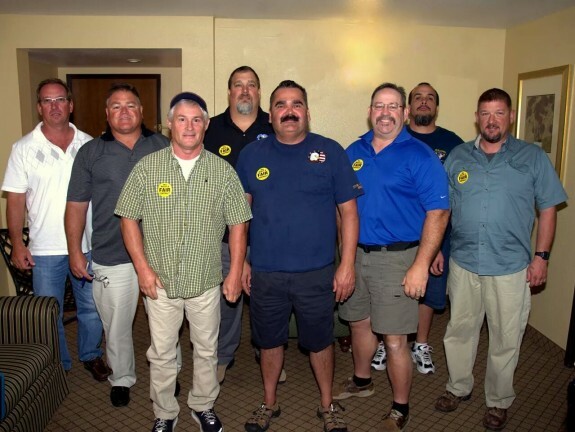 IUE-CWA Local 89119 membership has ratified a collective bargaining agreement with L-3 Vertex Aerospace which spans a five year period. Local 89119 provides maintenance and logistics support for the US Navy’s Naval Strike and Air Warfare Center (NSAWC) aircraft at Naval Air Station Fallon, Nevada. The Local President Jeff Martens is the chairman for the seven member bargaining committee. The bargaining committee was assisted in their effort by Staff Representative Eric Benjamin and Service Contract Alliance Chairman Bill Archer. The bargaining process spanned a month. The first session of negotiations terminated in the committee rejecting the Company’s final and best offer. Through mutual agreement, the current CBA’s expiration date was extended for a period of three weeks to allow for continued negotiations. The Company returned to the table for a second round of negotiations with very little progress and offering an amended final and best offer. The committee’s recommendation to the Local membership on the amended offer was one of neutrality. The offer contained some hard won language changes but still lacked the significant and necessary changes required to receive the committee’s recommendation. The amended final and best offer was reviewed and rejected by the Local membership. The Local membership stated in a unified voice that they were not going to accept anything less than a fair contract. An agreement which addressed some of the recurring problems which were experienced during the first contract with this Company as well as one which was fair in application across all work areas. The Company was surprised at the resolve and unity displayed by the Local and retreated saying: “it may be months before we are able to return to bargain any further.” In an answer to that message, the Local assembled to overwhelmingly vote and approve the option to strike. The Bargaining Committee Chairman then approved to immediately issue a press release availing the public of the details of the negotiation and the possibility of an impending strike action. Within a week of the press release, the company was compelled to return to negotiations with the Local. The company listened to and adequately addressed the Local’s remaining concerns. The Local membership agreed on the final adjustment and voted to ratify the agreement. The Local 89119 bargaining committee recognizes that without the support and unity of our Local membership that we could not have succeeded in this effort. We would like to collectively acknowledge that without all the excellent training and support provided to us over the course of the last five years from the IUE-CWA, there is literally no way we could have been successful in our negotiations at this or any other time. Thank you all very much.